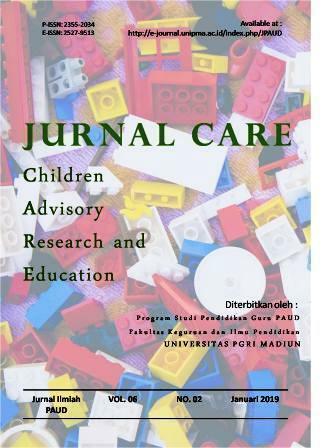 JURNAL CARE is a scientific journal on Early Childhood Education that aims to communicate research results of professors, teachers, practitioners, and scientists in the field of early childhood education covering the fields of basic teaching in preschool, applied science and analytical-critical studies in the field of care-giving, child protection and child nutrition and health. Target readers of the journal are professors, students, teachers and practitioners of early childhood education. JURNAL CARE has registered number ISSN: 2355-2034 (printed) & ISSN: 2527-9513 (online) which is published twice a year, in January and July. 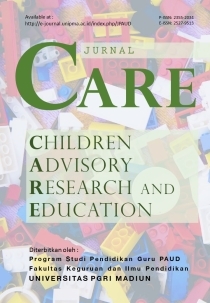 Jurnal CARE release a new template for article. Template use for Volume 5 No 2 and so on. Template can be download at right sidebar.